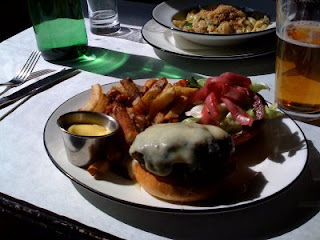 Following on from yesterdays somewhat marathon of taste testing four burger places in Manhattan, I thought while exploring Williamsburg in Brookyln, I would reacquaint myself with the Grassfed Cheeseburger at Diner. The diner is a 1920’s Kullman Diner and the decor is fantastic. Frankly, this burger beats all the burgers we sampled yesterday. It is a perfect burger: really juicy inside, charred on the outside, cooked to perfection, on a toasted bun. The french fries are excellent and served with a side of mayonnaise (it doesn't get better than that).